As a "Tapestry Collection" hotel, I was expecting more luxurious accommodations than what I received. My room consisted of Hilton Garden Inn furnishings among hardwood floors and a beautiful steel I-beam. How disappointingly average. The lobby is very nice, but the breakfast area is small and crowded during morning rush hour. I was in town for accepted students day at SU. The location of this hotel was perfect. Breakfast was decent. Parking was free (awesome) and they let me leave my car in the lot even after checkout. Much appreciated. Room was very cool. Nice private separation between king size bed and pull out couch for my son. I would definitely stay here again if he chooses Syracuse University! 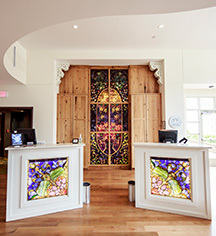 While the Church/Museum like exterior may give you pause, this is a very upscale, friendly and innovative hotel. Conveniently located to Syracuse University campus (walking distance). Stephanie, the bartender is a font of knowledge on the area, restaurants, directions, history, etc. She grew up and lives there. The complementary breakfast is exceptional (real eggs - not fake powdered, great oatmeal-with all the accoutrements ). Friendly staff, also a variety of interesting guests (in a good way). Stayed here before, I'll be back. First time staying here - we were on the first floor, and we were concerned that we would be able to hear noise from the bar. Great, quiet room: we did not hear anything once we closed the door! We invited friends to join us for a drink before dinner, and received very slow service at the bar. It was also disappointing that the only snack to share was a candied nut / bacon combination. It sounded odd, but was very good. Suggestion would be to have extra staff at the bar on a Friday night, and to have more appetizers! 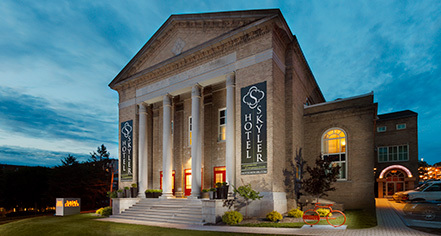 Hotel Skylar is a quiet little hotel that use to be a church. The rooms are nice but a little different layout. The hallways don't follow the normal layout either. I like that it is a different kind of hotel, yet still holds true to the brand. Truly a quiet gem in town.